then at best you’ll see a bunch of similar statements in the lists, each responsible for a small fraction of the workload. There is also a good chance that your heaviest SQL won’t show up in those lists at all, if it’s overshadowed by frequently run statements with unchanging parameters (or using binds). In such situations, one can query AWR views directly, using force_matching_signature to identify logically identical queries that only differ by parameter values. 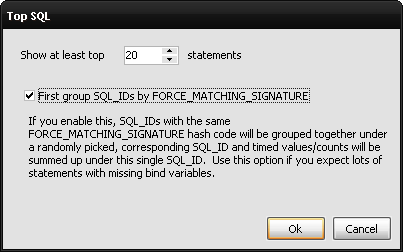 The report groups statements by force_matching_signature, but if force_matching_signature=0 (as e.g. for PL/SQL calls) it uses sql_text instead.